Compactness in football can be best defined in terms of the spacing between teammates. Staying compact essentially means limiting the space in relation to a team mate and maintaining relatively short distances. The word relatively is very subjective here. If the whole team is positioned within a ten yard boundary it would still be compact in a literal sense but is certainly not compact in a footballing sense. The structure of the team is as important as the spacing when a team wants be compact. Essentially, compactness affords stability in defensive phases and better connectivity while building attacks. The key aspect that comes into play when compactness is mentioned is the ‘space’. By limiting the space offered to the opponents, a team can shut shop and defend and look to break out in numbers. A compact team can limit the space in between the lines and stop the opposition attackers getting in between the midfield and defense. The biggest feature of staying compact when defending is the minimal amount of space that a player has to cover in order to cover or mark the opponent. The better connectivity that is offered by staying compact also ensures that a player in the compact structure has a team mate in proximity that can cover him when beaten or doubled up. By staying compact the team also can dominate the space through numerical and positional superiority. While defending, teams can stay compact while using a mixture of a man to man and zonal marking systems. Sometimes, a single player is allowed to break the structure to follow an opposition player across the field to man mark him. In this situation it is important for the rest of the team to adjust accordingly to the situation to maintain the structure. The concept of overloads comes into picture here as the team that stays compact can have numerical superiority over the opponent in all parts of the pitch, if correctly executed. BY enjoying 2v1 or 3v2 situations in the center of the pitch or on the wings, a team can drastically negate the influence of the opposition. This can particularly be useful when the opponent has a squad that is stronger in terms of individual quality. In recent years we have seen numerous high pressing sides like Borussia Dortmund, Barcelona and now the likes of Liverpool, Spurs and Sevilla enjoy a lot of success by adopting a high octane approach. This high pressing philosophy requires a very compact and disciplined side. All high pressing teams base their success laid on good compact structures and connectivity within their defensive block. Only a strong understanding and coordination between teammates allow a proactive pressing game. If three players rush in to press an opposition player, it is important for the rest of the team to maintain a high line and a compact structure as if the press is beaten, the opposition will suddenly find numerical superiority in dangerous areas. Managers like Pep Guardiola and Jurgen Klopp encourage winning the ball back early and higher up the pitch. This is possible when a team moves up and down the pitch as one with limited gaps in between the lines. This can ensure that if the forwards move forward to press the ball carrier, the midfielders in behind can contribute to the second line of pressing immediately and try to force the turnovers. It can also be said that a team that stays compact can help avoid the press by having better connection within their positional blocks and more passing options. By staying compact and pressing high up the pitch, a team can look to force turnovers in possession and look to score on the counter. This is a very effective tactic as the opposition has minimal time to recover and there is also not much order in their defensive shape in these situations. The turnovers that are effected are dangerous when the team has a lot of options when breaking forward. This again is possible only when there is proximity in the positioning of these players, which can be achieved via staying compact. This is a very important concept as teams that are only horizontally compact can be exploited by swift pass combinations. A good compact structure is one that sees a team stay compact both horizontally and vertically. Horizontal compactness ensures that the central occupancy is achieved. Vertical compactness when combined with this will ensure that there are no gaps to exploit for the opposite team. This however requires a lot of discipline and practise and is difficult to coach. 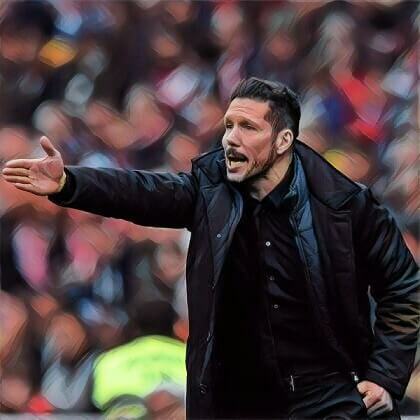 Teams like Diego Simeone’s Atletico Madrid are the perfect example of how a team should stay compact and their success has largely been down to this facet. It is to be noted though that a highly compact team can be undone by a switch of play to the opposite flank as the whole pitch cannot be covered this way and a free man can exploit this. This is precisely the reason why high intensity should be maintained within a block so that the switch in play cannot be easily facilitated. Atletico Madrid with their narrow and deep 4-4-2 effectively dealt with the switch to the opposite flank by shifting to the other side immediately. The only way teams could attack was with crosses from the free man but Atletico’s center backs had no problems in dealing with them. Managers like Roger Schmidt, Marcelinho, Diego Simeone, Jurgen Klopp(?) are all exponents of this and look to set their team out in a very compact manner. It is difficult for a team to perfect this and requires a lot of hard work and coaching. However, the advantages that a team can enjoy by staying compact are high and the team can benefit as a whole because of this.